Kitchen Magic continues to expand your options, bringing new and innovative products to the home. Zodiaq®, a premium quartz surface material, represents the latest miracle of science. DuPont Zodiaq® quartz surfaces – a new category of surfacing material that captures the radiance of quartz crystal with depth, clarity and strength. Cool, tranquil and sparkling, Zodiaq® embraces both nature and technology. The quartz in Zodiaq doesn't just give surfaces dramatic, radiant style. Quartz is one of the hardest materials in nature, so it also creates surfaces that are durable, practical and carefree. 10-year Warranty Never needs sealing, polish or reconditioning One of the hardest materials in nature. Stain-resistant Scratch/chip resistant Heat resistant Non-porous. Is There a Difference between, Zodiaq, Silestone and Cambria? Just How "Green" is the Zodiaq Terra Collection? 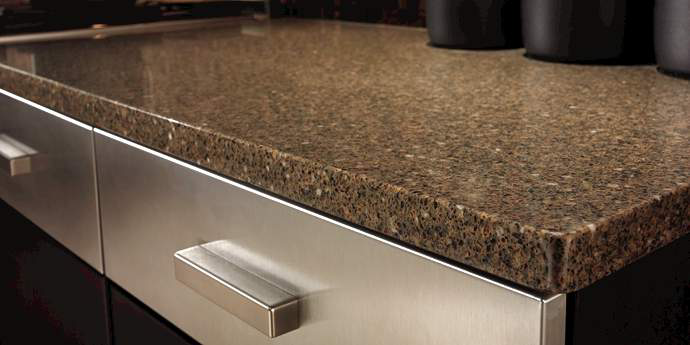 What is the Best Quartz Countertop Color for Dark Cabinets? Which Quartz Colors Work Best With Cherry Cabinets?